Bar grating saddle clips feature a steel saddle that spans two bearing bars and is held to the supporting structure using a fastener of your choice. Their simple design is easy to install and works with a wide range of grating types. Most economically priced, available in: Galvanized Steel, Aluminum and Stainless Steel. Marco Specialty Steel can supply saddle clips for any custom bar grating fabrication. We offer high quality solutions for clients in a range of industries, including oil and gas, offshore drilling and various manufacturing applications. Contact our office directly to speak with a representative about our full selection of bar grating clips and anchors, as well as other fastening products. Marco Specialty Steel provides bar grating saddle clips in carbon and stainless steel. Choose stainless for outdoor applications or other environments where superior resistance to corrosion is preferred. For less-demanding applications, carbon steel is an economical alternative. Saddle clips can be used on grating with 15/16″, 1 3/16″ and 1 3/8″ bearing bar spacings (15, 19 and 22 space sizes). Standard hole sizing supports the use of ¼” self-tapping bolts, self threaders, weld studs or bolt and nut fasteners. Your choice of fastener should be specified with your order as they are separate from the clips. Please see chart below for available TEK Screws. 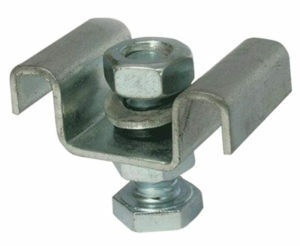 G clips are similar to bar grating saddle clips but feature a separate bottom component that connects to the underside of the supporting structural beam. As a result, they offer improved strength compared to saddle clips. The other major benefit to G clips is that they are faster and easier to install. G clips are also available with a wider range of top sizes and configurations that expands the range of potential applications. G clips are more expensive than saddle clips, and they should be reserved for heavy-duty applications where their extra fastening power is required. Marco Specialty Steel can help you assess your needs and your budget to determine the best type of bar grating fastener for you. Your choice of fastening product is critical for any bar grating that needs to be removed periodically. The use of clips and anchors instead of welding the grating in place allows for more flexibility and easier cleaning. 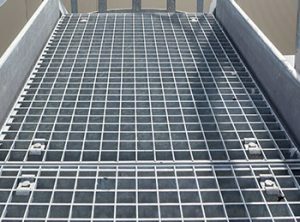 As a one-stop shop for steel grating fabrication, we offer solutions for all customers. 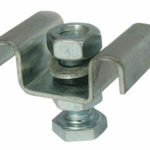 Bar grating saddle clips are one of our simplest and most economical options. Use the contact form on this page to request a quote today.